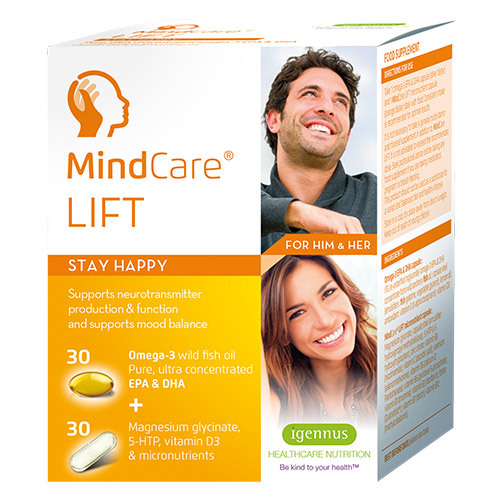 MindCare® Lift is an advanced supplement designed to help adults stay happy, enjoy life and maintain a positive outlook. We often neglect our health and wellness when the pressures and demands of life make it challenging to eat well, exercise and get sufficient sleep. Targeted MindCare Lift dual capsules combine nutrients scientifically proven to support mood balance, the brain and neurotransmitters. This specialised formulation brings together pure, ultra concentrated omega-3 EPA & DHA, magnesium glycinate, 5-HTP, vitamin D3 and essential micronutrients. Taken consistently, these key nutrients support the brain and central nervous system, promote neurotransmitter production and function and support mood balance. Omega-3 DHA contributes to the maintenance of normal brain function. Vitamins B6, B12 and folate help to maintain normal homocysteine levels, supporting normal neurotransmitter function. B-vitamins, vitamin C, folate and magnesium support normalpsychological function. Vitamin B12 contributes to normal neurological function. B-vitamins, vitamin C and magnesium contribute to the normal functioning of the nervous system. Vitamin B5 contributes to normal synthesis of vitamin D and some neurotransmitters. Magnesium glycinate; capsule shell (emulsifier: hydroxypropyl methylcellulose); 5-HTP (L-5 hydroxytryptophan); zinc citrate; vitamin B3 (nicotinamide); vitamin C (ascorbic acid); selenium (selenomethionine); vitamin B5 (calcium-D Pantothenate); vitamin B6 (pyridoxal-5-phosphate); vitamin B1 (thiamine); vitamin B2 (riboflavin); folate (Quatrefolic®); vitamin B7 (biotin); vitamin B12 (methylcobalamin). Take 1 omega-3 EPA & DHA capsule (silver blister) and 1 MindCare Lift micronutrient capsule (orange blister) daily with food. Consistent intake is recommended for optimal results. Medications for depression (antidepressant drugs) may interact with 5-HTP. Below are reviews of Igennus MindCare Lift - 30+30 Capsules by bodykind customers. If you have tried this product we'd love to hear what you think so please leave a review.